Throughout its 40+ years of business, The John Roberts Company has had a strong commitment to sustainability, adopting forward-looking practices years ahead of the industry. While sustainable printing methods and a reduction in carbon emissions had become routine at JR, the company had not yet communicated its leadership to a larger audience before partnering with TSG. Working together, we produced an award-winning brochure, companion website and promotional marketing materials. The design and messaging created for this campaign are now at the core of all JR brand communications. 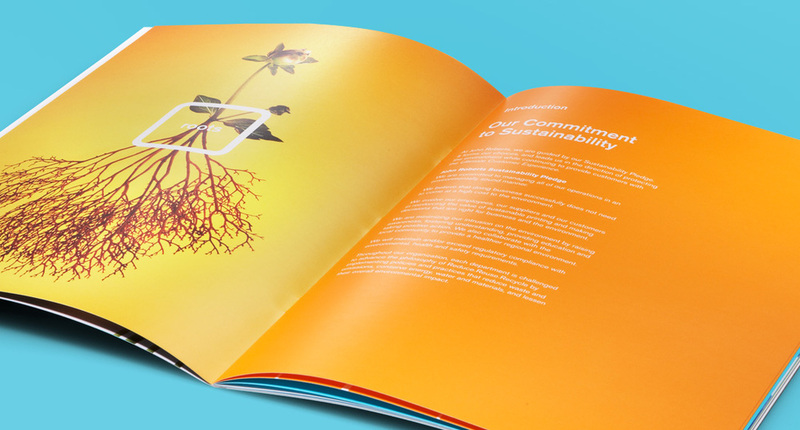 To document JR’s sustainable business practices and their environmental impact, we designed this 20-page Sustainability Report. Environmentally-conscious printing methods, including the use of soy inks, recycled paper and press sheets optimization, were used throughout the campaign. The overwhelming response to the Sustainability Report led to a web-based version and development of promotional materials. With the increased recognition from the report, The John Roberts Company received the Heidelberg ECO Award, presented to the most sustainable printer by the world’s largest printer-manufacturer.